So with years of experience in the publicity field, Nancy struck out on her own. She decided to focus on helping people and businesses affected by the recession better market themselves. Nancy knew that, in a tight economy, her clients’ best hope was to differentiate themselves from the competition—and that she had the skills to help them do just that. To set her own business apart from the competition, Nancy first needed to gain a bigger audience. In order to do this, Nancy began blogging and creating landing pages in WordPress to build her email list. Over the course of a decade, through her online presence and other efforts, she steadily built an email list of more than 25,000 contacts. As a publicity guru, she didn’t have much trouble making connections. But when it came time to take the next step—reach new audiences and launch higher-end products and services—Nancy was stymied. She knew that one promising strategy would be to start running joint-venture webinars (that is, webinars co-hosted and co-promoted with another expert in a related field). But as an independent consultant, she was a bit of an unknown quantity, and she didn’t have the data to demonstrate how effective a partner she could be. To try part of the solution she discovered for yourself, download our free Webinar Funnel Marketing System course—then read on for the details of Nancy’s success strategy. So she decided to give it a shot. On Christmas Day of 2014, Nancy created her first LeadPage®. This landing page offered a bio template from her book Bye-Bye Boring Bio as the lead magnet. Nancy knew this was the most popular template in her book based on feedback from her current customers, so she thought it’d be an ideal lead magnet. She was right. Almost immediately after launching the page and emailing her list a link, her conversion rate shot up to 81%. 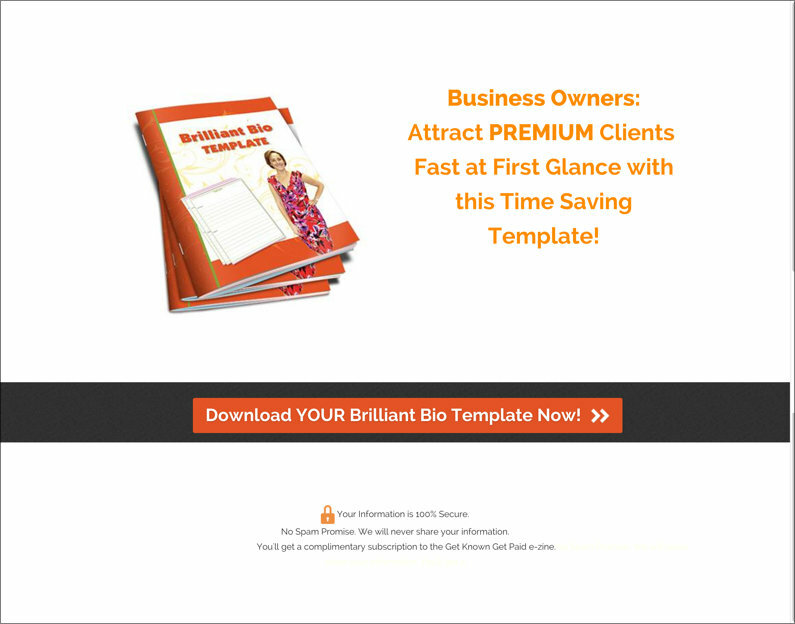 As soon as leads opted in for the bio template, they’d see a thank-you page with a video and a big button inviting them to register for a webinar on “the three biggest bio blunders even smart business owners make those stop premium clients from hiring them.” Nancy made sure to mention the bonuses she’d be giving away during the webinar as an extra incentive. But if that wasn’t enough to get her leads to download right away, Nancy had another plan. To nudge the fence-sitters, she’d send two follow-up emails linking to two more landing pages offering lead magnets that further teased the kind of expertise she had to offer: a bio blueprint and a four-page report on getting potential clients to know, like, and trust your business. At the end of the webinar, she’d finally ask for the sale, directing attendees to sign up for her new coaching sessions. The launch of this new service was a big success: five figures in sales, all from this relatively simple strategy. Having accomplished all this on her own, Nancy had the confidence to approach a much bigger name in the business-coaching business and suggest hosting a joint-venture webinar. She had devised a complex, high-end new product, the Get Known to Get Paid training package, and knew that its success would depend on reaching a larger audience. Armed with the data that was now accessible to her in LeadPages®, Nancy reached out to business coach Ryan Eliason, whose followers number more than 30,000 on Twitter alone. They struck up a partnership. At the end of the webinar, Nancy was able to promote her new Get Known to Get Paid training package—and again, she found plenty of takers. With this webinar alone, she brought in $30,000 in sales. Plus, she’d launched a product that was 10 times more valuable than anything she’d launched previously. She had the satisfaction of discovering a webinar funnel strategy she could use over and over again. It was almost icing on the cake that, after marketing to her partner’s list, she now had 22% more email subscribers than she’d started with. ”If numbers are not your favorite thing, the more you lean into it and learn, the more light you can shine. That’s been a powerful lesson for me with LeadPages®.” For Nancy, the realization that she needed to find and embrace her marketing metrics came from her career-defining tendency to see everything in terms of telling a story.Now, “I’m looking at the numbers as a way to tell a story about my progress,” she says. Once she had that insight, Nancy was able to pick out which numbers would best help tell her story to potential partners, then find software that would give her easy access to exactly those numbers. “Take the step to create a LeadPage® that converts, elevate the message for your LeadPage® so you can elevate your results, guide your people to the roses you want them to enjoy, and keep running.” You might notice that Nancy’s landing pages are pretty simple. Her lead magnets draw on knowledge she already has and content she’s developed in the course of creating paid products.All she really has to refine for each page is her message—and, of course, that sits firmly within her wheelhouse. Operating with such efficiency means that she can launch new pages, campaigns, and webinars quickly, deliver value to new leads automatically, then move on to the next big thing. 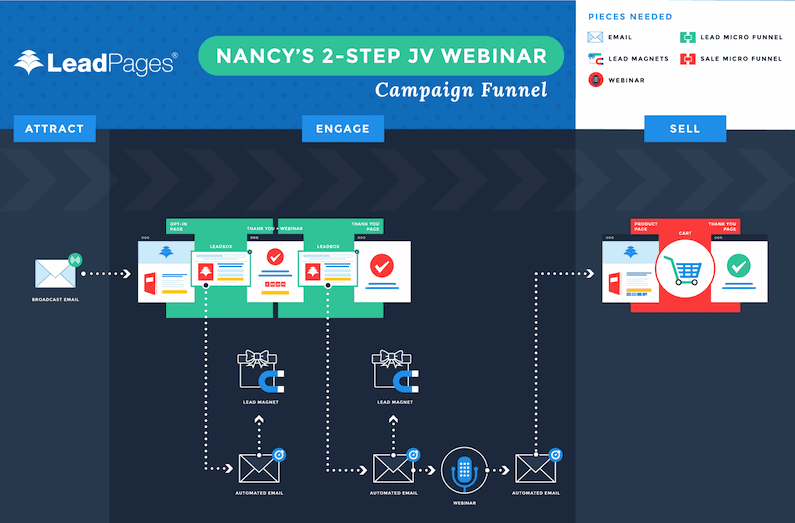 When you have as much inherent strategic savvy as Nancy, what you really need are the tools to help you execute fast—and with LeadPages®, she’s not only up and running. She’s accelerating. What do you think of Nancy’s strategy? Did any of her tactics surprise you? Tell us in the comments.